Definition at line 94 of file llfont.h. Definition at line 178 of file llfont.h. Definition at line 133 of file llfont.h. Definition at line 127 of file llfont.cpp. References FALSE, mAscender, mBitmapHeight, mBitmapWidth, mCurrentOffsetX, mCurrentOffsetY, mDescender, mFallbackFontp, mFTFace, mIsFallback, mLineHeight, mMaxCharHeight, mMaxCharWidth, mNumComponents, mValid, and NULL. Definition at line 147 of file llfont.cpp. References mCharGlyphInfoMap, mFTFace, mRawImagep, and NULL. Definition at line 340 of file llfont.cpp. References addGlyph(), addGlyphFromFont(), FALSE, llassert, mCharGlyphInfoMap, mFallbackFontp, mFTFace, mIsFallback, NULL, and TRUE. Definition at line 515 of file llfont.cpp. Referenced by addChar(), loadFace(), and resetBitmap(). Definition at line 395 of file llfont.cpp. References FALSE, height, insertGlyphInfo(), llassert, mBitmapHeight, mCurrentOffsetX, mCurrentOffsetY, mFTFace, LLFontGlyphInfo::mHeight, mIsFallback, LLFontGlyphInfo::mIsRendered, mMaxCharHeight, mNumComponents, mRawImagep, LLFontGlyphInfo::mWidth, LLFontGlyphInfo::mXAdvance, LLFontGlyphInfo::mXBearing, LLFontGlyphInfo::mXBitmapOffset, LLFontGlyphInfo::mYAdvance, LLFontGlyphInfo::mYBearing, LLFontGlyphInfo::mYBitmapOffset, NULL, renderGlyph(), resetBitmap(), S32, setSubImageLuminanceAlpha(), TRUE, and width. Referenced by addChar(), and addGlyph(). Definition at line 172 of file llfont.cpp. Definition at line 178 of file llfont.cpp. Definition at line 315 of file llfont.cpp. Referenced by getXAdvance(), hasGlyph(), and LLFontGL::render(). Definition at line 166 of file llfont.cpp. Definition at line 521 of file llfont.cpp. 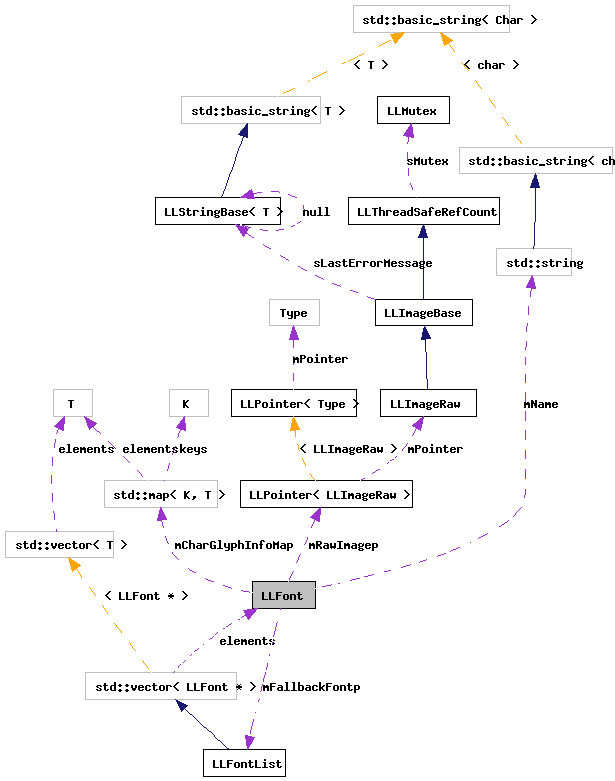 References get_if_there(), getGlyphInfo(), insertGlyphInfo(), llassert, mCharGlyphInfoMap, mFallbackFontp, mFTFace, LLFontGlyphInfo::mHeight, mIsFallback, LLFontGlyphInfo::mIsRendered, mMaxCharWidth, LLFontGlyphInfo::mWidth, LLFontGlyphInfo::mXAdvance, LLFontGlyphInfo::mYAdvance, NULL, and renderGlyph(). Referenced by LLFontGL::charFromPixelOffset(), LLFontGL::firstDrawableChar(), LLFontGL::getWidthF32(), and LLFontGL::maxDrawableChars(). Definition at line 605 of file llfont.cpp. References get_if_there(), llassert, llverify, mCharGlyphInfoMap, mFTFace, LLFontGlyphInfo::mGlyphIndex, mIsFallback, and NULL. Referenced by LLFontGL::charFromPixelOffset(), LLFontGL::firstDrawableChar(), LLFontGL::getWidthF32(), LLFontGL::maxDrawableChars(), and LLFontGL::render(). Definition at line 326 of file llfont.cpp. References FALSE, getGlyphInfo(), llassert, mIsFallback, LLFontGlyphInfo::mIsRendered, and TRUE. Definition at line 381 of file llfont.cpp. Referenced by addGlyphFromFont(), and getXAdvance(). Definition at line 183 of file llfont.cpp. References addGlyph(), f, FALSE, gFTLibrary, LLPointer< Type >::isNull(), llmin(), llround(), mAscender, mBitmapHeight, mBitmapWidth, mCurrentOffsetX, mCurrentOffsetY, mDescender, mFTFace, mIsFallback, mLineHeight, mMaxCharHeight, mMaxCharWidth, mName, mNumComponents, mRawImagep, NULL, S32, and TRUE. Definition at line 592 of file llfont.cpp. References gFontRenderMode, llassert, mFTFace, and NULL. Definition at line 297 of file llfont.cpp. References addGlyph(), FALSE, llendl, llinfos, mCharGlyphInfoMap, mCurrentOffsetX, and mCurrentOffsetY. Referenced by addGlyphFromFont(), and LLFontGL::reset(). Definition at line 107 of file llfont.h. Definition at line 160 of file llfont.cpp. Definition at line 624 of file llfont.cpp. References i, j, llassert, mIsFallback, mRawImagep, and target. Definition at line 161 of file llfont.h. Referenced by LLFontGL::drawGlyph(), LLFontGL::getAscenderHeight(), getAscenderHeight(), LLFont(), loadFace(), and LLFontGL::render(). Definition at line 167 of file llfont.h. Referenced by addGlyphFromFont(), LLFont(), and loadFace(). Definition at line 166 of file llfont.h. Referenced by LLFont(), and loadFace(). Definition at line 179 of file llfont.h. Referenced by addChar(), getGlyphInfo(), getXAdvance(), getXKerning(), insertGlyphInfo(), resetBitmap(), and ~LLFont(). Definition at line 170 of file llfont.h. Referenced by addGlyphFromFont(), LLFont(), loadFace(), and resetBitmap(). Definition at line 171 of file llfont.h. Definition at line 162 of file llfont.h. Referenced by LLFontGL::getDescenderHeight(), getDescenderHeight(), LLFont(), loadFace(), and LLFontGL::render(). Definition at line 176 of file llfont.h. Referenced by addChar(), getXAdvance(), LLFont(), and setFallbackFont(). Definition at line 173 of file llfont.h. Referenced by addChar(), addGlyphFromFont(), getXAdvance(), getXKerning(), LLFont(), loadFace(), renderGlyph(), and ~LLFont(). Definition at line 175 of file llfont.h. Referenced by addChar(), addGlyphFromFont(), getXAdvance(), getXKerning(), hasGlyph(), LLFont(), loadFace(), and setSubImageLuminanceAlpha(). Definition at line 163 of file llfont.h. Referenced by LLFontGL::getLineHeight(), getLineHeight(), LLFont(), loadFace(), and LLFontGL::render(). Definition at line 169 of file llfont.h. Definition at line 168 of file llfont.h. Referenced by getXAdvance(), LLFont(), and loadFace(). Definition at line 160 of file llfont.h. Definition at line 165 of file llfont.h. Definition at line 190 of file llfont.h. Referenced by addGlyphFromFont(), loadFace(), setRawImage(), setSubImageLuminanceAlpha(), and ~LLFont(). Definition at line 181 of file llfont.h.